Engagement is one component of technology integration. Often by putting a piece of technology in front of the students or in their hands, they become interested or "engaged" in the activity. However, we can look a little more deeply at engagement by considering if the technology is not just capturing the interest of the student, but if it is actually engaging them actively in the content (not just the bells and whistles of the software). It is important to look for "time on task" engagement. In addition, engagement should include social or co-use of the technology tool rather than isolated learning with a tool. Students should be working together through the tool (eg...synchronous collaboration) or with the tool (eg...in pairs or groups with a device). Below are three questions to ask when measuring for engagement in learning goals through a technology tool. Does the technology allow students to focus on the task of the assignment or activity with less distraction (Time on Task)? Does the technology motivate students to start the learning process? Does the technology cause a shift in the behavior of the students, where they move from passive to active social learners (co-use or co-engagement)? *Click here to see examples of instructional strategies that can be employed to help elicit engagement when using the digital tool. The research below highlights the research that informs the Triple E component for engagement. 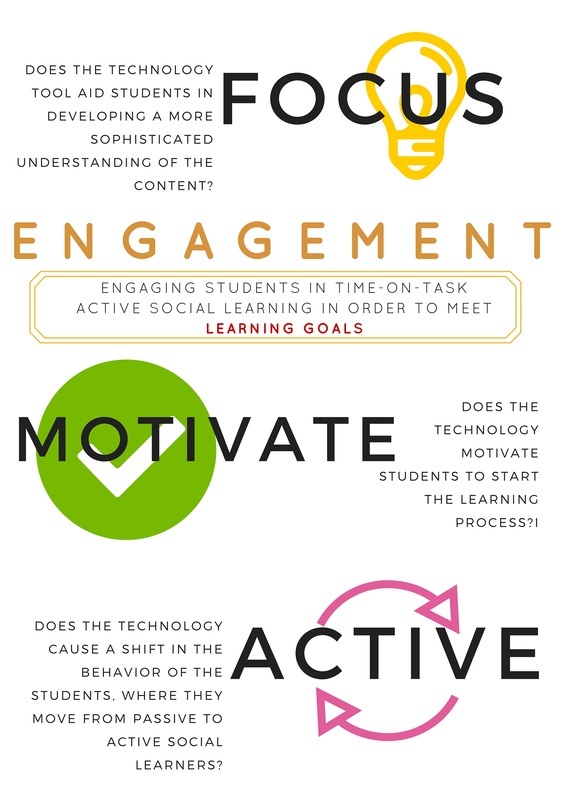 Engagement in technology-enhanced lessons does not necessarily correlating with achievement. Studies on engagement uncovered that while students may be physically present and appear to be actively involved in using the technology tools, in reality they might still be cognitively disengaged from the learning goals (Linnenbrink &Piintrich, 2003). The tool should help focus student’s attention on the learning goals and the task at hand and not distract from it (Wartella, 2015). Active learning is when students are actively focused on the learning goals and not just “busy” doing what looks like learning. “active learning occurs when children are “minds-on”—that is, engaged in thinking, reflecting, and effortful mental activity…swiping, tapping, and physically engaging with an app is not the same as “minds-on” activity. “ Ellen Wartella (2015). A recent report by the Joan Ganz Cooney Center (Vassy et al., 2015) emphasized the importance of social in learning with technology devices for children. Researchers have promoted the ability to connect with others through media or while using media together as key ways children deepen their learning (e.g., Hirsh-Pasek et al., 2015; Guernsey,2012; Takeuchi & Stevens, 2011). “joint media engagement, and socially interactive learning more generally, offer young children an environment that can help them learn through the Vygotskian notion of scaffolding, or extending children’s learning beyond what they would learn left on their own.” Ellen Wartella (2015)​. Significance of a "human" as part of co-use in early learning with technology tools. "Co-using media together allows parents to bridge the gaps in their child’s knowledge of the media content and use of the media device." (Zach & Barr, 2016). Does the technology allow students to focus on the task of the assignment or activity with less distraction? Students are focused on the task because the software is helping them create the code that represents their content learning goals (characterization, setting, plot..etc). There are no games or rewards at the end of using the software that distract from the process of learning. Does the technology motivate students to start the learning process? Students are interested to connect their code to their complex novel. They are not just "swiping through" their iPad, rather they are carefully planning a code that is representative of their goal so they can see the physical results in the programmable ball that moves. Does the technology cause a shift in the behavior of the students, where they move from passive to active social learners (co-use)? ​Students are working in groups co-using the devices (rather than 1 device per child). Collaboration and constructing knowledge together.